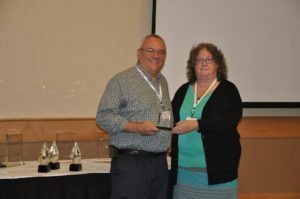 The Onondaga County (New York) Department of Emergency Communications Supervisor of Dispatch Operations Keith Ducett, Jr. was presented with the “Individual Contribution to the Profession Award” at the biennial NYS GIS Association Conference called NYGeoCon 2017, on Wednesday, October 18, 2017 at the Lake Placid Convention Center, and the presenting speaker was Ross Baldwin from the Town of Southampton. The award was presented by Katherine Barnes from the NYSDEC. Both of them were a part of the NYS GIS Association awards committee. The person who nominated Keith Ducett, Jr. for this award was Paula F. Cutrone. Paula is the Service Development Data Analyst & Research Specialist at CENTRO. Katherine Barnes, from the NYSDEC, presenting the award to Keith Ducett, Jr.
Keith Ducett Jr. is the Geospatial Information Officer for the Onondaga County Department of Emergency Communications, an active member of the NYSGIS Association as well as the Central NY Regional GIS Users Group (CNYRGIS). Keith promotes GIS throughout the year and especially around GIS Day, giving presentations to his GIS group and local schools. He has been involved in many E911 projects such as addressing for the Onondaga Nation, Syracuse, and Onondaga County. He also works directly in creating data for E911 applications and training 911 staff in CAD and GIS. Keith Ducett Jr.’s contributions to the profession over the past year are exemplary and numerous. His passion for the profession, for the work that he does, and for the community, make him both an inspiration and a role model to all GIS professionals. It is with great pleasure that we recognize Keith Ducett, Jr. for all of his hard work promoting GIS here in New York State. At this year’s conference, it was announced that next fall the NYS GIS Association will once again have its biennial GeoSpatial Summit in Onondaga County (at the Welch Allyn Lodge in the Town of Skaneateles).